Today's activity can be for a variety of ages, not just toddlers! All four of my kids (right now ages 9,6,4,1) had fun with our PVC Pipe Ball drop! We are doing a 10 Days of Toddler Activities Challenge and we are on DAY 3! Follow me on Instagram and see the activities daily (I'm @kristinatoddlerapproved) Each day we are sharing a simple activity that you can try with your toddler! The materials are pretty simple, though sometimes we have a few specific things you need that you might not have at home. We post the materials the night beforehand on Instagram stories. Most of these activities are exciting for older kids too! 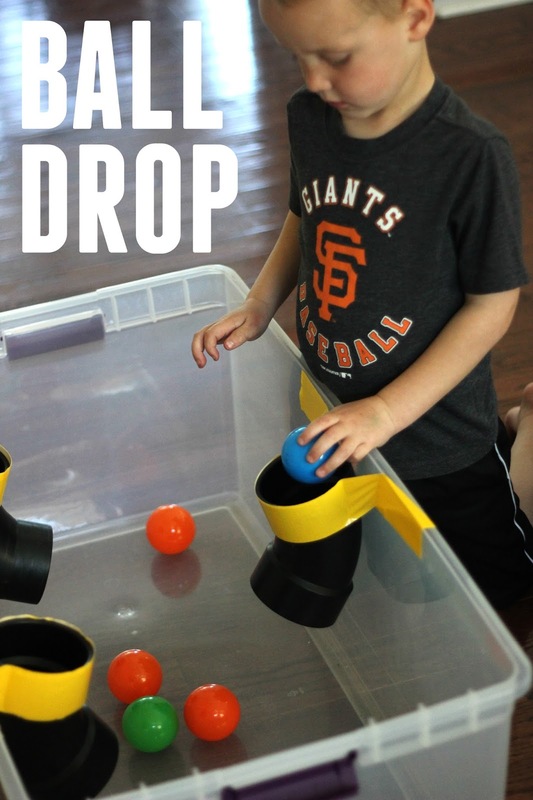 Our PVC Pipe Ball Drop is a fun way to work on hand-eye coordination and get kids moving! The materials are pretty simple! We visited Home Depot for a few items that we didn't already have! Just grab some DUCT tape and tape the PVC Pipe elbows to the side of your plastic tub. I used two layers of tape to make sure the pipes were extra secure. If you have kids that hang on these or sit on them, they will pull off... but otherwise, ours stayed put for a long time! 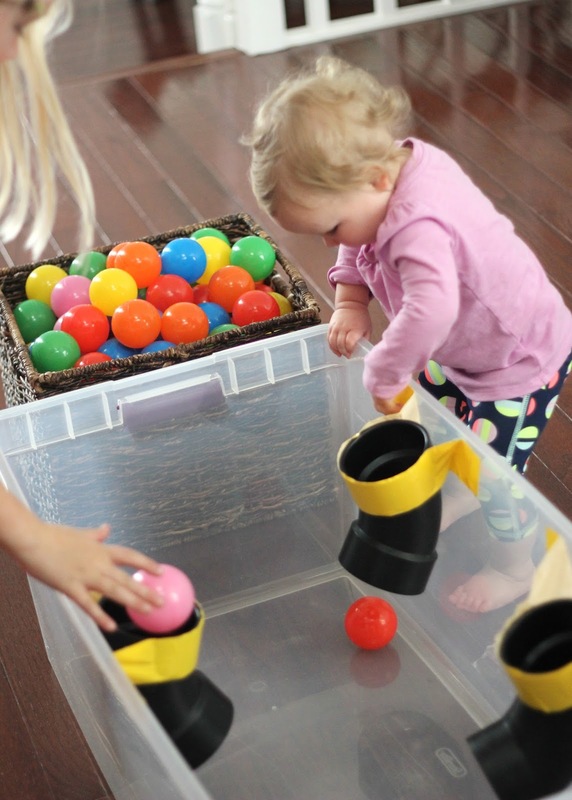 Set up some plastic balls or any other toy that can fit through the 3 inch wide pipe. Tell the kids they can start playing! I didn't really direct them WHAT to do, they just figured out that the ball tunnels were fun to use. They tried to throw a few in at a time. My older son and daughter liked using the pipes as basketball hoops and they started close to the tub and kept moving further and further back trying to score baskets. It was hard and they kept at it for a long time! I love finding activities that all of my kids can have fun with! Have you ever used PVC pipe for any projects before? If you want want a more permanent PVC Pipe ball drop you can use suction cups or screws to secure these to a plastic tub or a window. Here are a few other favorite PVC Pipe ideas that we want to try! Don't forget to follow along with our 10 Days of Toddler Activities and join me over on Instagram. I am @kristinatoddlerapproved. This looks like so much fun. My son is also 15 months and always ALWAYS moving. I need to buy him a bin and start letting him play inside it. He already pulls out the plastic bins I put his toys in and sits in them.